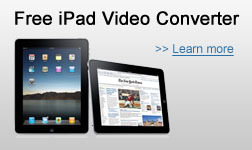 Convert high definition video such as HD TS, HD AVI, HD WMV, HD MOV, HD MPG, HD MKV, HD MP4 to iPad HD video. Support conversion in batches to save your time. Crop video frame size, split into segments, merge files and adjust output setting in terms of your preferences. The Free iPad video converter can easily convert AVI, MPEG, TS, OGM, MKV, WMV, DivX, MOV, RM, VOB and such video formats to iPad video MP4, Thus you can watch any videos in your iPad on the go. Extract audio from videos and turn them into iPad MP3/AAC/WAV music files, Meanwhile, it also can convert to iPad music MP3, M4A, WAV from multiform audios like MP3, WAV, WMA, RA, OGG, AAC, AC3, MP2, etc.